Traversone - thanoscardgamess jimdo page! Traversone, also known as Rovescino, Ciapano, Tressette a non Prendere, Perdivinci or Vinciperdi is a trick-taking game and is the reverse game of Tresette. A 40 card pack is used. In the North East of Lombardy the Italian suits. In the South or North West of Lombardy the game is played with 40 cards of the Milanese pack which has French suits. In each suit the cards rank as follows: 3 (highest), 2, Asso (ace), Re (king), Cavallo (horse, or queen), Fante (jack), 7, 6, 5, 4 (lowest). 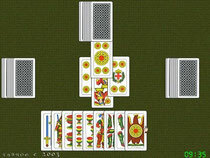 The cards have point values and the object is to avoid taking tricks containing valuable cards. There is an extra penalty for winning the last trick.There are no trumps. The player to dealer's right leads first. Any card may be led, and the other players must play a card of the suit led if they have one. A player with no card of the suit led may play anything. The highest card of the suit led wins the trick, and the winner leads to the next trick. You can select between two Italian decks, a latin-suited one and a french-suited one.